Sometimes I post things on this site because I want them, and just assume you do too. 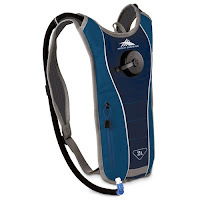 For instance, I want this High Sierra Wave 70 Lightweight Hydration Backpack. Mine is 15 years old, and might be coated with bacteria by now. Go to eBay and they are just $20 . These retail for $60, and that's without the free shipping. I use mine when I go on a long hike or bike ride. It's got a two-liter hydration bladder and a zip pouch where you can put phone, wallet, and radio in. That beats hiding my keys under my car when I'm about to trek the hills.